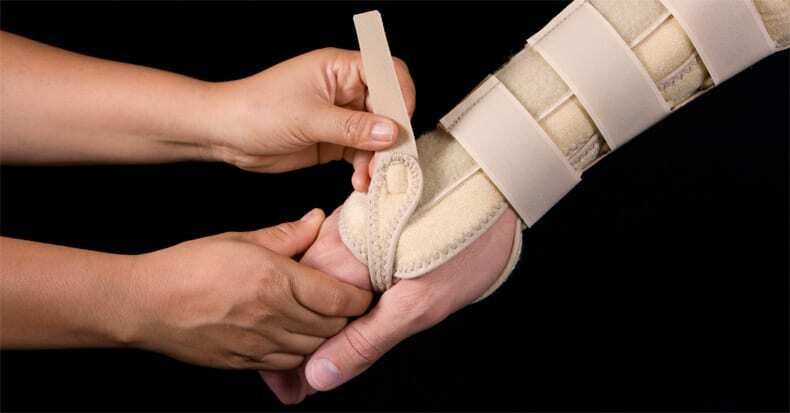 Wrist splints are often a beneficial form of CTS self-care, as they can assist in relieving the pressure within the carpal tunnel by restricting wrist flexion and extension. Because we cannot control the position of our wrist during sleep and the pressure on the nerve worsens the more it bends forwards or backwards, splints are most commonly used during sleep. There are literally hundreds of options of splints available online that range from simple glove-like splints (some with and without the fingers covered) to full arm splints. The majority block wrist motion and use Velcro closures with metal bars on the bottom and/or top of the splint. Your doctor of chiropractic can help you choose the best splint for your particular case. There are studies that have attempted to isolate one form of treatment from others for conditions like CTS, but as noted in a 2012 Cochrane report, many of these studies involve small sample sizes, making it difficult to draw firm or hard conclusions. Moreover, healthcare providers typically utilize MANY approaches simultaneously to achieve the best, most prompt results, keeping surgery as the last resort. Typically, the non-surgical management of carpal tunnel syndrome (CTS) includes several approaches such as splints; rest; job modifications; anti-inflammatory measures like ice, drugs, vitamins, and herbs; physical modalities, such as ultrasound and laser; and manual therapies, such as manipulation and mobilization. Care may also focus on relieving pressure on the median nerve in other anatomical locations (the neck or shoulder, for example) as dysfunction elsewhere on the course of the nerve can contribute to a patient’s CTS symptoms. Furthermore, a treatment plan may also address other conditions that can contribute to the build-up of pressure in the carpal tunnel such as diabetes or hypothyroidism. Generally, it’s more challenging to manage the condition when a patient has waiting years or even decades to seek care. Thus, for the best possible outcome, please have a doctor of chiropractic evaluate your wrist and hand symptoms sooner rather than later.